Altitude Chophouse installed a Bright Agrotech Farm Wall to grow herbs for its restaurant and bar in Laramie, Wyoming, last summer. Photo courtesy Bright Agrotech. As we slip into the dark half of the year, we don’t have to say goodbye to growing our own fresh herbs, lettuces and other greens. There is an option for those of us without a greenhouse, hoop house or cold frame, even if we have limited natural light or limited space. No more stooping over short little plants. No more weeds. No more intensive watering schedule. Bright Agrotech, www.brightagrotech.com, a Laramie-based start-up, has been perfecting this system that maximizes production for every square foot. It works for farmers as well as hobbyists—indoors or out. The company now employs 30 people, many coming straight from the University of Wyoming. As magical as this system sounds, it really works. Growers on every continent except Antarctica are using it. In 2015, the U.S. pavilion at the world’s fair in Milan, Italy, installed a demonstration Bright Agrotech ZipGrow Farm the size of a vertical football field, like a giant billboard full of leafy vegetables. Locally, the system is being used at Cheyenne Central High School. There, agriculture teacher Ty Berry has his classroom’s system set up on a cart so he can take it places, including the state and county fairs last summer. Elsewhere, Altitude Chophouse in Laramie grew edibles on an outside wall during the summer using this system. The Farm Wall starts with towers. They will remind you of rain gutters upended, but they are made of food-grade white plastic which wraps around part of the open side, leaving a slot the length (or the height) of the tower for plants to sprout from. Towers come in 3 or 5-foot heights. Bright Agrotech refers to these components as ZipGrow Towers. That’s because the growing medium can be “zipped” in and out of the towers. The plants grow in a matrix made of curly fibers from recycled water bottles. They have a brown, protective silicone coating. Otherwise light would cause algae infestations in the originally clear material. So how do you get the plant into the matrix material? Simple. It comes in two halves. You “zip” it out the end of the tower, spread the two halves just enough to place seedlings in between at regular intervals and “zip” it back into the tower. The plants spill out the lengthwise slot. As you can imagine, the plastic matrix isn’t going to hold water well, so strips of wicking material are added with the plants. The next step is to place the towers between the upper and lower horizontal gutters. The lower gutter is on the floor. The upper gutter can be slid onto a bracket on a wall (indoors or out). An emitter keeps the tower below it watered. Photo by Barb Gorges. What makes the Farm Wall water-smart is that it is a hydroponic system. Water constantly circulates. About once a week the water reservoir needs to be topped off. It looks like and is lined up with the other towers but has no growing slot. Water is poured into the top. At the bottom is a spigot that allows only a certain amount of water to sit in the lower gutter. A small submersible pump there sends the water up through a hose and across the top, inside the upper gutter. There’s an emitter above each tower, keeping it watered. Without soil to provide essential nutrients, you must add them to the water yourself. What you add depends on what you are growing, which is where Bright Agrotech can give you advice. There are several commercial fertilizer mixes available, or maybe you’d like to try aquaponics, in which the water circulates through a tank of fish and picks up nutrients from the fish poop. While on my tour in Laramie one unexpected thing I learned from my guide, marketing team member Amy Storey, is that the more growing cycles a unit of matrix material has been through, the better it gets. All the old roots and all the potting soil left behind by the seedlings enables good microorganisms to get established and start helping with their usual job, making it easier for plants to absorb nutrients. One plus of the Farm Wall system: no pesticides are necessary, as long as good horticultural practices are maintained. And there are no weeds since you aren’t tilling the garden and causing weed seeds to sprout. There are several considerations with this system. The 5-foot high, four-tower package is $599 (free shipping). The two-tower, 3-foot high version is $369. There is also an 8-tower option. Beyond that size, you need to look at the commercial farm version. You also need an electrical outlet for the water pump. While the commercial farming version needs to be hooked up to plumbing, the Farm Wall doesn’t. But you may want to install it where a few splashes of water won’t be a problem. An electrical conductivity meter will help you know how you are doing with fertilization, though you might make do with nutrient package directions and your own observations. You’ll need someplace warm to start seedlings under lights. Speaking of lights, you’ll need some florescent grow lights set up vertically in front of the Farm Wall if it isn’t set up outside or in a greenhouse. Obviously, root crops are not going to do well in such limited root space. So far, the most successful crops have been flowers, herbs, lettuces and other smallish greens. At the University of Wyoming Extension, horticulturist Chris Hilgert experimented with strawberries, but hasn’t been successful—yet. For growing small vegetables commercially, vertical farming is certainly more efficient than one layer of 6 to 12-inch high plants, especially in a greenhouse. Also, in an urban area, the cost of lighting and water pumping may be less than transporting produce from elsewhere. In Jackson, where the town is isolated and the growing season very short, Vertical Harvest, www.verticalharvestjackson.com, grows for local restaurants, grocery stores and its own store in a 3-story glassed-in area on the side of a parking garage. On a tenth of an acre they grow the equivalent of 5 acres of conventionally farmed land through the winter. Ty Berry has this Farm Wall in his classroom at Cheyenne Central High School planted with herbs and flowers. It was about to be replanted with beans. Photo by Barb Gorges. This semester Berry’s students are planting beans in their classroom Farm Wall. It was paid for by an educational grant he wrote. Bright Agrotech also provided curriculum ideas to maximize the educational possibilities. I remember 25 years ago when Cheyenne parent-teacher organizations raised the funds to pay for computer labs for their schools. Now computers are part of the school district’s budget and every student seems to have what amounts to one in their back pocket. Perhaps someday it will be completely normal for a wall of every school building to produce healthy food for school lunches. Unless kids are already packing Farm Wall salads from home. Note: Laramie, at 7200 feet elevation, is in a hostile environment for growing vegetables, which may have been the inspiration for Bright Agrotech founder Nate Storey, a native of Cheyenne with a PhD from the University of Wyoming. But his version of vertical gardening is catching on worldwide. The Farm Wall installed by Altitude Chophouse becomes part of the landscaping in downtown Laramie, Wyoming. Photo courtesy Bright Agrotech. Categories: Gardening, Herbs, Uncategorized, Vegetables, Vertical gardening | Tags: Altitude Chophouse, aquaponic, Bright Agrotech, Farm Wall, garden, herb gardening, hydroponic, Laramie, vegetable gardening, Vertical gardening, Vertical Harvest, ZipGrow | Permalink. Master gardener Kathy Shreve planted a strawberry jar outside her kitchen door this year with Thai basil, “Purple Ruffle” basil, flat-leaved parsley, sage, chives, Greek oregano, French thyme and summer savory, including the herbs required for several of her favorite varieties of ethnic cooking. I have to admit, my interest in growing herbs was sparked by old lyrics made popular by Simon and Garfunkel. Back then, these four herbs mentioned were considered “essentials.” Now I grow them for their scents, flavors and flowers. The definition of an “herb” is a useful plant, the leafy part, used in smaller quantities than vegetables. Spices come from other plant parts–roots, bark, seeds. Some herbs are grown as medicinals. However, without the oversight of a trained herbalist, I wouldn’t recommend experimenting with herbal remedies. 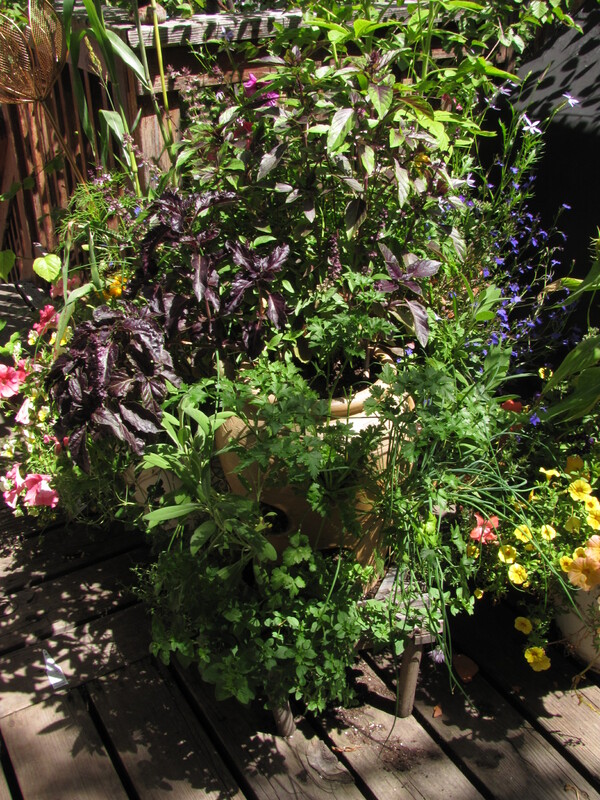 Instead, let’s look at culinary herbs in my garden–all easy to grow. My experience in Cheyenne is that some are annuals, while others self-seed. 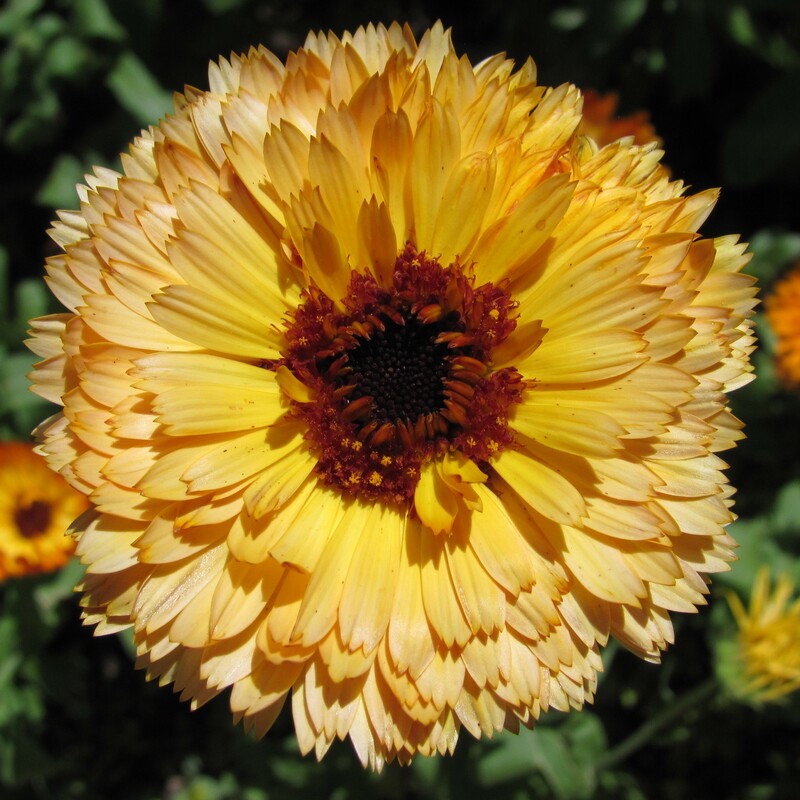 Some are short-lived perennials and some survive a number of winters. I usually mulch my herb garden in late fall with a 3 to 4-inch layer of crispy, curled, dried leaves from our ash trees. Straw can also offer protection. Remember to never treat herbs with pesticides of any kind– herbicides, insecticides or fungicides–if you plan to eat or cook with them. Otherwise, they don’t need anything that flowers and vegetables don’t also require. Fall is a good time to check local nurseries, which may still have a few herb plants you can set on the window sill for the winter and plant outside next spring. Having fresh leaves to pluck means you don’t have to bother with drying. Master gardener Linnie Cough grows herbs using drip irrigation and wood mulch, and Victorian-era styled plant markers. Next spring you can tuck your plants into a mostly sunny corner in your garden the way master gardener Linnie Cough has, next to vegetables or flowers. Or pop them into a strawberry planter like master gardener Kathy Shreve does. She sets it on the deck within reach of her kitchen door. Herbs are happy in any situation, from containers to the symmetrical beds of formal herb gardens. Parsley (Petroselinum) – This is a biannual classified into two groups, curly-leaved and the Italian flat-leaved. Mine self-seed and now new plants come up every spring. Chop leaves and add to soups, salads, Italian dishes, just about anything. Or dry or freeze them. 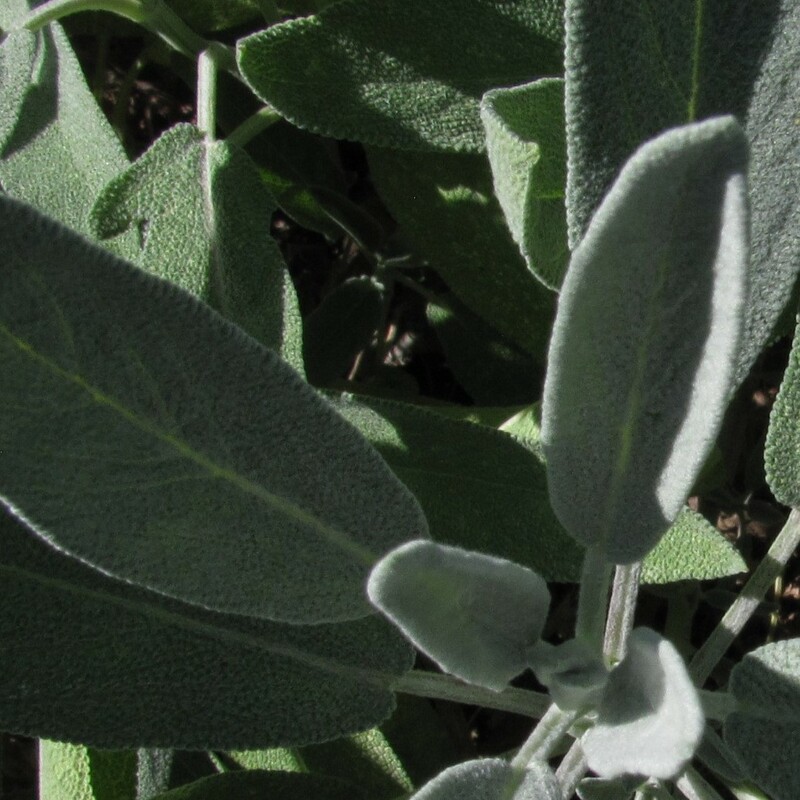 Sage (Salvia officinalis) – Don’t mix this up with sagebrush, which has toxic oils, even though it also has a woody stem, is evergreen and has leaves of sage-green (and now other colors). I’ve been able to keep plants growing for several years at a time. We flavor roasts with sage. Rosemary (Rosmarinus officinalis) – Another woody herb, it is often seen as a little potted evergreen tree. Master gardener Michele Bohanan brings hers in for the winter. I’ve been able to mulch and overwinter the prostrate variety a few winters. Rosemary is great in meat and vegetable dishes. 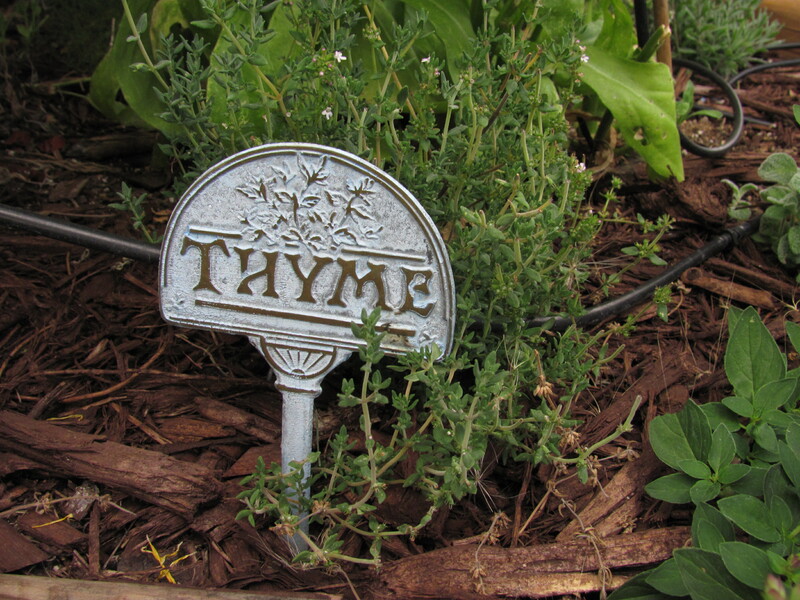 Thyme (Thymus) – A low growing woody perennial in the mint family, some kinds work well as ground cover between patio stones. Apparently there are dozens of kinds, with different scents and ornamental leaves. T. vulgaris is the culinary type. We’ve admired its tiny flowers more than we’ve cooked with it. Perhaps we should put sprigs under our pillows, as they did in the Middle Ages, to aid sleep and ward off nightmares. Lemon balm (Melissa officinalis) can be made into tea. I like it for the lemony scent. But it is a mint and has invaded most of my raised bed. I yank it out wherever I want to plant something else. Wise gardeners keep it in containers as they would with chocolate mint (Mentha x piperita ‘Chocolate’), peppermint and spearmint, in containers, either above ground or in the ground. 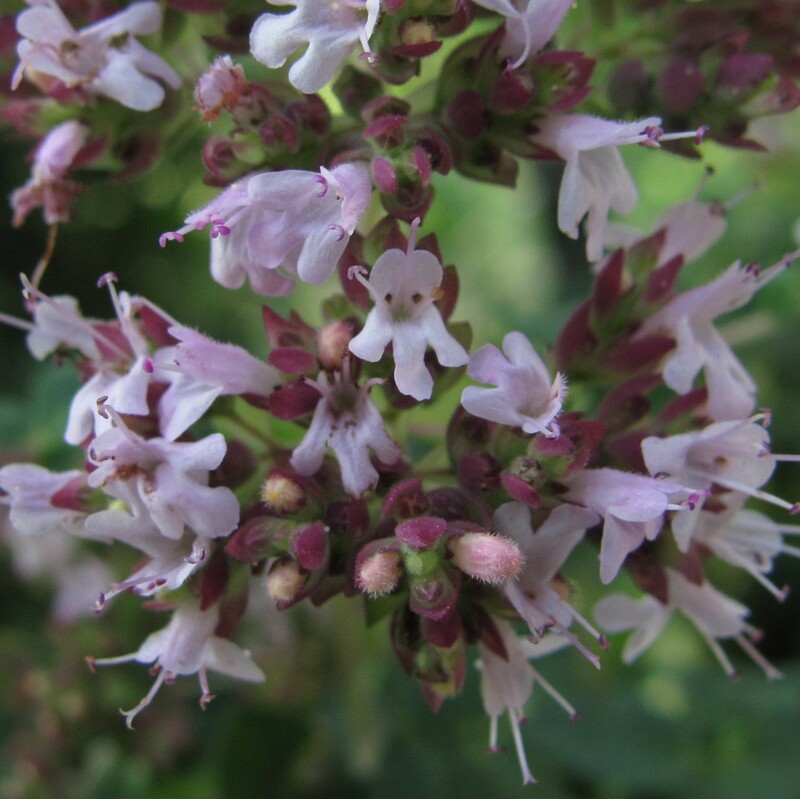 Oregano (Origanum vulgare) – It’s one of my favorites—for Italian cooking as well as for the tiny flowers that attract lots of bees. It is a mint, but fairly well-behaved, spreading each year just enough to dig up and share some with friends. Sweet basil (Ocimum basilicum) – There are many varieties with leaves of different colors and flavors. This annual, is easy to start from seed indoors and transplant to the garden, but the first hint of frost will finish it off. Besides Italian dishes, the leaves are also sprinkled in salads and soups. 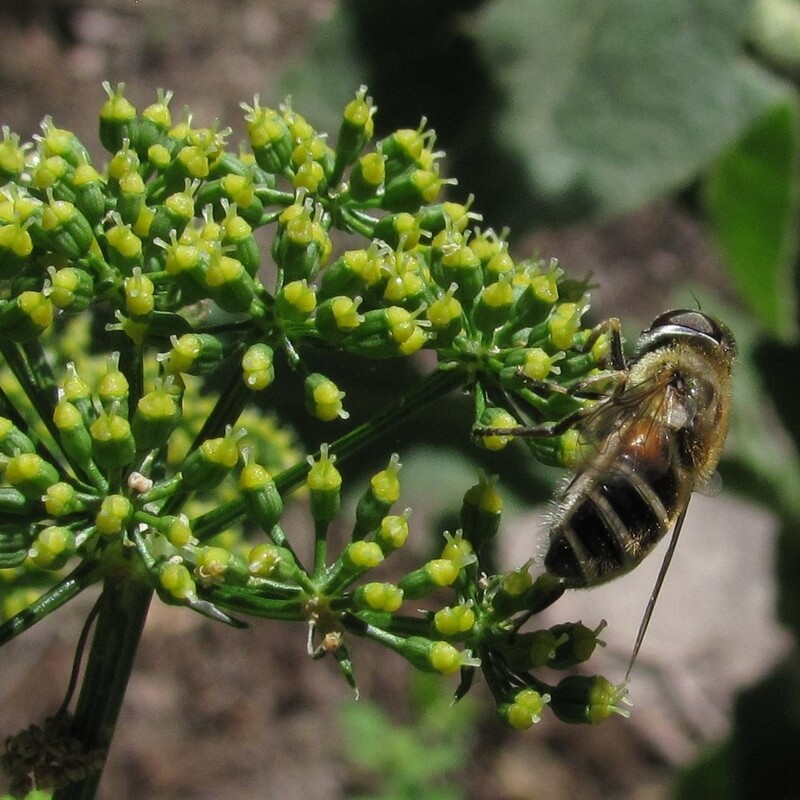 Pinch off flowers for better foliage, but leave some for the bees. This year Kathy grew “Purple Ruffle” and Thai basil. 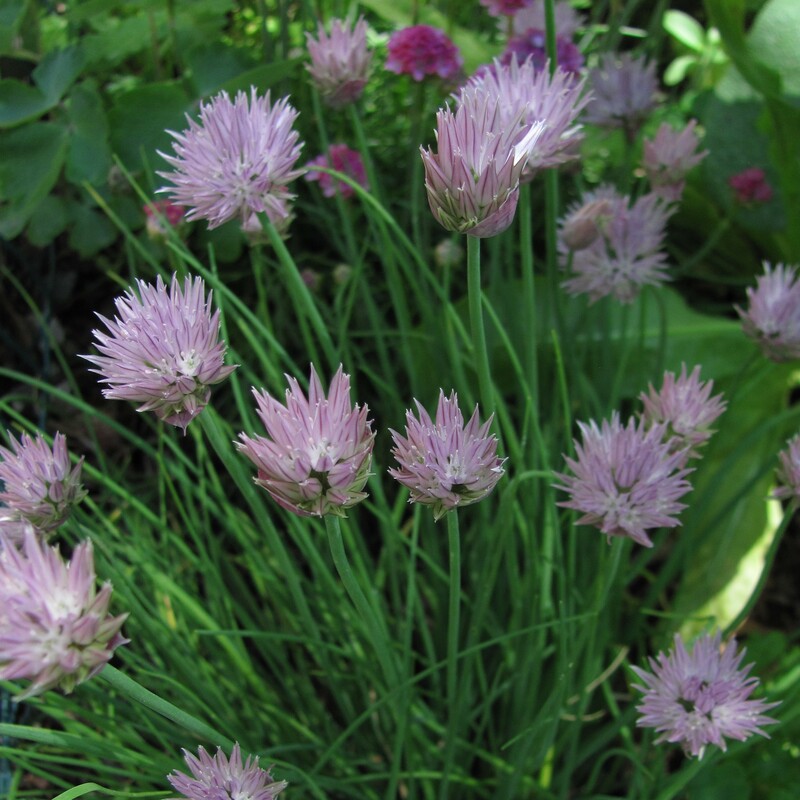 Chives (Allium schoenoprasum) – A clump of chives is self-perpetuating. Mine is 25 years old. The grass-like leaves are easy to snip into any dish where onion would be at home. The ball-shaped purple flowers are also edible as individual florets. This is one of the culinary herbs native to North America. Nasturtium (Tropaeolume) – The showy orange and yellow flowers are reward enough for taking time to grow this annual, but the flowers can add color and a peppery flavor to salads. Direct seed it in the garden in spring. 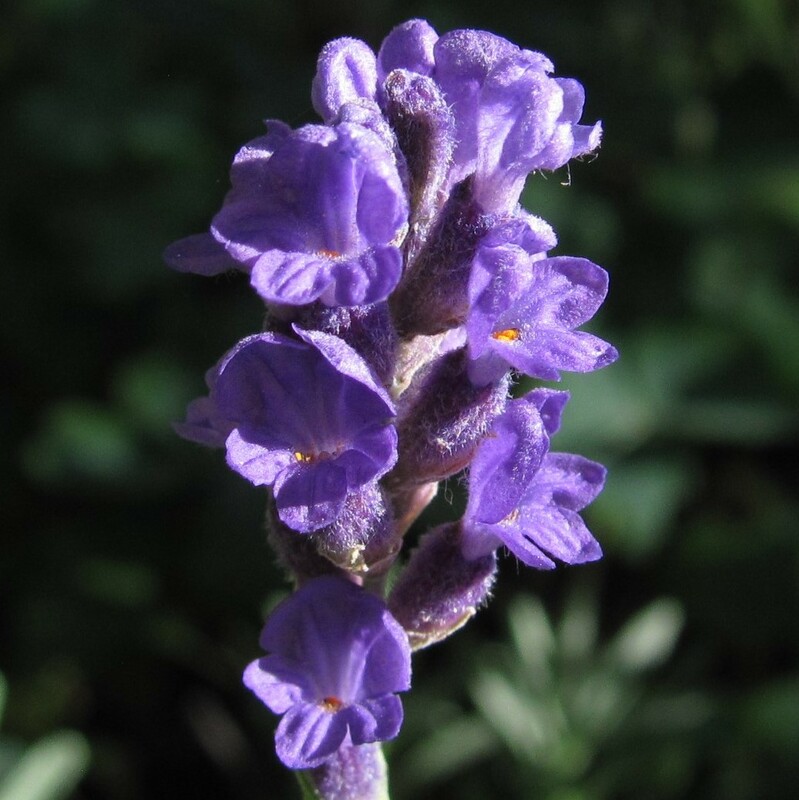 Lavender (Lavandula) – I love the scent in soaps and sachets. Leaves can be used with roasts and the flowers on desserts. “Munstead” is supposed to be cold hardy. Mine has overwintered several years now. 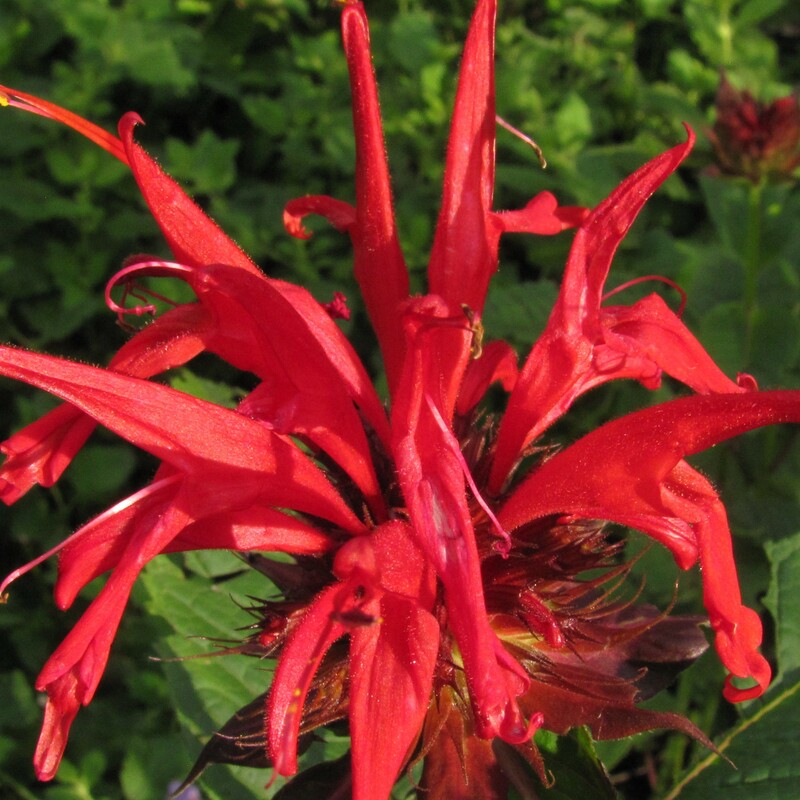 Bee balm (Monarda) – A variety I have with over-sized red flowers has been very popular with hummingbirds that migrate through Cheyenne mid-July through August. 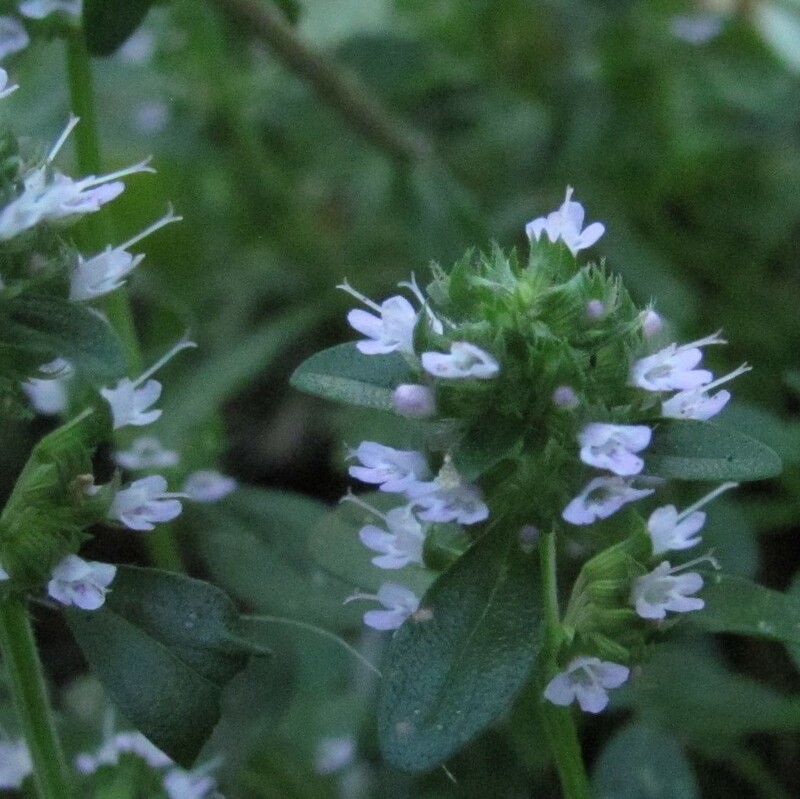 A slow-to-spread mint, the crushed leaves smell interesting and the flowers can be added to salads. Cheyenne gardeners have good luck with a number of other herbs: borage, chamomile, cilantro (the seeds are coriander, a spice), dill, fennel, lovage, Greek oregano and summer savory. In her book, “The Garden Primer”—a great all-around gardening book suitable for our climate—author Barbara Damrosch explains that what we’re after, flavor or scent, is the result of plant oils. Harvesting and storage should maximize them—if you aren’t just snipping a few leaves to add immediately to the soup. Hang dry – The oils are at their strongest just before plants bloom. On a nice day, cut stems and hang them upside down, inside a paper bag, to dry. Strip dry leaves and store in airtight containers. Freeze in ice cube trays – Basil doesn’t freeze well. Damrosch suggests pureeing it with butter or oil and then freezing it in ice-cube trays, then popping the cubes into a zipper lock bag so it’s easy to pull out what you need later. Freeze whole in sealed bag – Other herbs with less tender leaves can simply be frozen in a plastic bag. Preserve in oils and vinegars – Another way to preserve herb flavors is in oils and vinegars. Recipes abound in cook books and online. Gardening magazines are rife with recipes seasoned with herbs. My old favorite, “Organic Gardening” magazine, has morphed into “Rodale’s Organic Life,” but it still includes recipes, giving me ideas for more herbs to grow. And then I’ll need to look for seeds in the specialty catalogs, like Richters, www.richters.com, in which I counted 38 kinds of mint. It’s fun having a collection of herbs, even just for rubbing a few leaves so I can enjoy their scent while working in the garden. Categories: Herbs | Tags: basil, beebalm, calendula, chives, gardening, herb cooking, herb gardening, herb preserving, herbs, lavender, lemon balm, nasturtium, oregano, parsley, rosemary, sage, thyme, Wyoming | Permalink.